Stay in touch by subscribing to our RSS Feed. 2010 Land Cover of Canada – Landsat-7, 30-metre resolution now available! The Canada Centre for Remote Sensing (CCRS) at Natural Resources Canada produced this new high-resolution dataset of Canada’s 15 land cover classes from 13,350 Landsat-7 satellite images taken between 2009 and 2011 for cloud- and snow-free national coverage. The 30-metre resolution of the dataset will help improve the accuracy of local and regional-scale analyses and applications. Map showing 2010 Land Cover of Canada produced by Canada Centre for Remote Sensing (CCRS) using 13,350 Landsat-7 satellite images. CCRS produced 2010 Land Cover of Canada as part of the Commission for Environmental Cooperation (CEC) North American Land Change Monitoring System (NALCMS) in partnership with the United States and Mexico. The continental and national datasets will provide baseline for refreshed 30-metre resolution land cover of Canada and North America every five years. Visit the Physiographic Regions Interactive Map to learn more. Summary: publication of 122 NHN datasets including 31 NHN-CL3 or NHN-CL2 completeness level watersheds. With the publication of these new watersheds, nearly 10% of watersheds covering Canada has been improved allowing better analysis of hydrological networks. In addition, all territories are now at completeness level NHN-NC3. 63 watersheds were regenerated following watershed limits redefinitions. Maintening NHN is done as part of the GeoBase Surface Water Program (GeEAU). For more information about the Hydrographic Network Quality, please refer to the Completeness Level. This map shows the hydrographic watersheds affected by this release. Geospatial Data Extraction Tool: New formats available for Canadian Digital Elevation Data! The ESRI ASCII raster format is now available for the Canadian Digital Elevation Model (CDEM) and the Canadian Digital Surface Model (CDSM). The exchange formats for point data are CSV (.csv) (comma-separated values) and XYZ (.xyz) (space separated values). CanVec : New format available! With the aim of increasing accessibility to geospatial data while at the same time eliminating unnecessary costs for business, the Government of Canada is now providing OGC GeoPackage for CanVec data. This format is available online through the Geospatial Data Extraction Tool. You will find a detailed description of the OGC GeoPackage format on the following page: OGC GeoPackage Documentation. Please note that the GML format is no longer available. Automatically Extracted Buildings are now available on OpenMaps! Natural Resources Canada is pleased to announce its new data layer on OpenMaps. The richness of this new data layer comes from information on height and elevation of the buildings that will help support Canadian governments priorities such as emergency management, particularly for flood and earthquake risk analysis. This release contains close to 1 million building footprints. We will expand this coverage as more LiDAR data becomes available over Canada. Text Version: View of Automatically Extracted Buildings layer superimposed on a satellite imagery. You can access Automatically Extracted Buildings data and documentation from the Open Government Portal. WMS, Web Application and prepackaged FGDB and Shapefiles are available. High-Resolution Digital Elevation Model (HRDEM) generated from LiDAR – New data available! Natural Resources Canada is increasing the HRDEM product coverage by 30,000km2 by publishing 21 new datasets in six provinces (BC, SK, MB, ON, QC, NB). Mostly, this new publication of the HRDEM product adds 24,000 km2 in western New Brunswick, 5,500 km2 in southern Manitoba, the City of Nanaimo, B-C., and some other areas of interest in the south of the country. This map represents the National Elevation Data Strategy Status in Canada as of February 2019. The Canada Centre for Mapping and Earth Observation has created this map. You can download HRDEM data from the Open Government Portal. Use one of the following options to view the current inventory and to download datasets: "View on Map", "Project Footprints" or "Dataset Footprints", in KML, Shapefile or ESRI REST formats. For more information on the HRDEM product, consult the Product Specifications. The National Elevation Data Strategy aims to increase high-resolution elevation data coverage for Canada and improve accessibility to the products. Collaboration is a key factor to the success of the Strategy. Data is thus acquired by multiple projects from different partners. The HRDEM product is part of the CanElevation Series created in support of the National Elevation Data Strategy. GeoBase Collection - National Road Network (NRN) – Now under the responsibility of Statistics Canada! In the context of the ongoing government wide Web Renewal efforts, please note that the collection known as National Road Network - NRN - GeoBase Series – is under the responsibility of Statistics Canada. Any questions about this product should be sent to STATCAN.infostats-infostats.STATCAN@canada.ca. CanMatrix – Georeferenced, CanMatrix – Print Ready and CanTopo collections are now available under one folder! To facilitate search of our archived topographic raster maps, the CanMatrix - Georeferenced, CanMatrix - Ready to Print and CanTopo collections have been grouped under the following directory: http://ftp.geogratis.gc.ca/pub/nrcan_rncan/raster/topographic/. Here you will find the 6 scales available: 25k, 50k, 125k, 250k, 500k and 1M. This new directory structure allows you to quickly find all the editions/versions/formats available for a specific NTS file. The HTML index has been modified and there is a Readme in the documentation directory ".doc" on the FTP site to explain the new file nomenclature. Please update your links as soon as possible. New home page for the geospatial data on the NRCan website! The “Free Data – GeoGratis” web page has been archived and the sub-pages have been relocated directly under Topographic Information”. Please update your links as soon as possible. Redirection to the new link will be available for a limited time. Natural Resources Canada (NRCan) is proud to announce a new release of the High Resolution Digital Elevation Model (HRDEM) product for the Canadian Arctic! This new data covers nearly 3 million km² north of the 60th parallel. The data comes from the ArcticDEM project which aims to provide high-resolution digital surface models for all the Arctic regions of the planet. NRCan applied corrections and improvements to the data when possible. This image represents the National Elevation Data Strategy Status in Canada as of April 2018. The image consists of a map of Canada with the coverage of the HRDEM (High-Resolution Digital Elevation Model) files. The North of the 60th parallel the HRDEM area is in blue (80% of the territory) and the south of the 60th parallel the regions covered by HRDEM files are in green (4% of the territory), mostly concentrated in Manitoba, Ontario, Quebec, New Brunswick and Nova Scotia. The Canada Centre for Mapping and Earth Observation has created this map. You can download the HRDEM data from the Open Government Portal. Use one of the following options to view the current inventory and to download datasets: "View on Map", "Project Footprints" or "Dataset Footprints", in KML, Shapefile or ESRI REST formats. The level of details of this new data represents a significant advance if compare to the previous elevation products and, at the same time, offers great potential for the study of northern Canada. For more information on this new data and the improvements that were performed, please consult the Product Specifications. This image compares the CDEM (Canadian Digital Elevation Model) product on the left with the new ArcticDEM product on the right. The level of details is much more accurate with the ArcticDEM product. 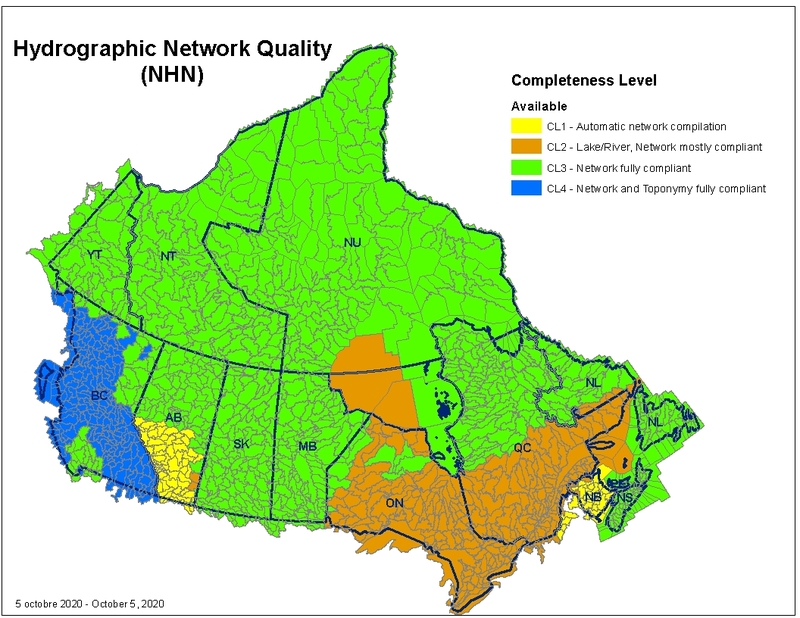 The National Elevation Data Strategy, implemented by NRCan, aims to increase Canada high-resolution elevation data coverage for Canada and improve accessibility to the products. Collaboration is a key factor to the success of the Strategy. Data is acquire by multiple projects from different partners. The HRDEM product is part of the CanElevation Series created in support of the National Elevation Data Strategy.